BOOKMAN: Who doesn’t have instant coffee? BOOKMAN: You buy a jar of Folger’s Crystals, you put it in the cupboard, you forget about it. Then later on when you need it, it’s there. It lasts forever. It’s freeze-dried. Freeze-dried Crystals. There’s some sort of irony or something going on here. You know, Starbucks – it of the McDonald’s-like ubiquity – conditions the world that so-so, overpriced brewed coffee is something we can’t live without. So when SB came out last week with their (heavily advertised) VIA instant coffee, it struck the News to Chew news desk as, well, weird. C’mon. Instant coffee? From Starbucks? I mean, my parents drink instant coffee – a product of their generation. And they’re in their 80s. So, Starbucks is taking on Taster’s Choice or Nescafe? Maybe it’s a brilliant marketing strategy – they’re closing outlets everywhere, so now they’re entering a more dormant revenue stream. 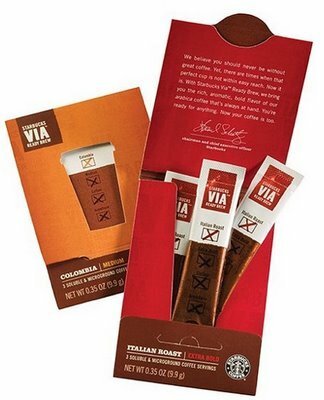 Now, the Starbucks advertising and hype is saying you can’t taste the difference between VIA and their fresh-brewed coffee. So NTC decided to give it a try. And the verdict? Not bad, actually. In fact, it was better then the fresh brewed you’ll get at certain times of the day at Starbucks. It might be worth keeping a few packs in the cupboard at work or home. Who knows? Maybe instant will be the new coffee trend? And then Folgers Crystals will be the new hipster anti-VIA coffee?